This lovely new home is a vacationer's dream. Situated right on the Delaware River, within sight of the Milford Bridge, the home features 3 spacious bedrooms, a loft, a spectacular kitchen (a 'foodies' dream) and family room, two-sided fireplace, a deck on each level of the house plus a large secluded deck on the river, outdoor bar, sun room and 4 full baths. Thoughtful planning for guests of all ages and capabilities include a four floor elevator and straight access shower, making it ideal for multi-generational families who want to enjoy time together. The house and expansive property afford you plenty of room to be together or be apart. Whether a romantic get away, time with friends and family or action-packed adventure is your goal, this river home is your ticket to relaxation. The home is large yet cozy; its warm atmosphere makes you feel far away even though you're only 90 minutes from NYC and 75 minutes from Philly. Relax by the wood-burning fireplace and enjoy the bright airy feel of the home and the spectacular view of the river. Or gather around the outdoor fire pit. Spot bald eagles, and great herons, swim or fish from the deck. Canoe, kayak and bicycles are available to you. Walk, cycle or cross country ski on 60 miles of tow path, a short distance from the home. Or explore lovely towns on the River like Frenchtown (an 8 minute drive), Stockton (15 minutes), Lambertville and New Hope, a scenic 25 minute drive down river. Young families may wish to visit Sesame Place, the Crayola Factory or Ringing Rocks. Has foosball table with air hockey, mini ping pong, etc. The house has a piano and misc instruments for your enjoyment and family band. There is 1 canoe and 2 kayaks for your use and a dock. 6 adults and 1 child's bicycles for your use. Tow path close by. The best vacation house rental! What an awesome place to come and spend a few days with friends. The house is absolutely amazing! Joan has thought of everything, it truly felt like home away from home with all the amenities she had. I have rented vacation houses before and this one was my favorite. We enjoyed sitting by the fire (inside & outside), cooking in the amazing kitchen and sitting on the dock by the river. The house offers even more than the pictures show! We didn’t want to leave. The town was a nice little place to walk to and check things out. I highly recommend The Ship Brewery & Restaurant! We will definitely be back! Beautiful property, very thoughtfully laid out. We had a fabulous time in this space that nurtured us. I use VRBO quite a bit and this was the cleanest, most peaceful home we have stayed in. We will be back. We came with friends to celebrate our 30th Wedding Anniversary. This place is beautiful, very up to date and clean. They have provided everything! Even though we had no children with us, the loft is a perfect place for the kids, even on rainy days. Loved all the decks. But my favorite was the one on the river. Thank you Joan for everything! Celebrated my 65th birthday with a fabulous long weekend with family in this amazing house. It is in a great location and has every amenity you could possibly think of. Joan was extremely helpful and easy to work with. Whether hanging on the deck, or biking on the tow patch, or kayaking on the river it was all awesome. Cannot say enough about the entire experience. We all look forward to doing it AGAIN!!! Amazing house and property! Wonderful stay! The house was gorgeous and spotlessly clean! Our stay was wonderful and we'd definitely be back again. It was perfect for a weekend getaway and the house had a great setup for a great stay. Joan was easy to communicate with and left clear and helpful house instructions and was even thoughtful and left us a bottle of wine to enjoy! 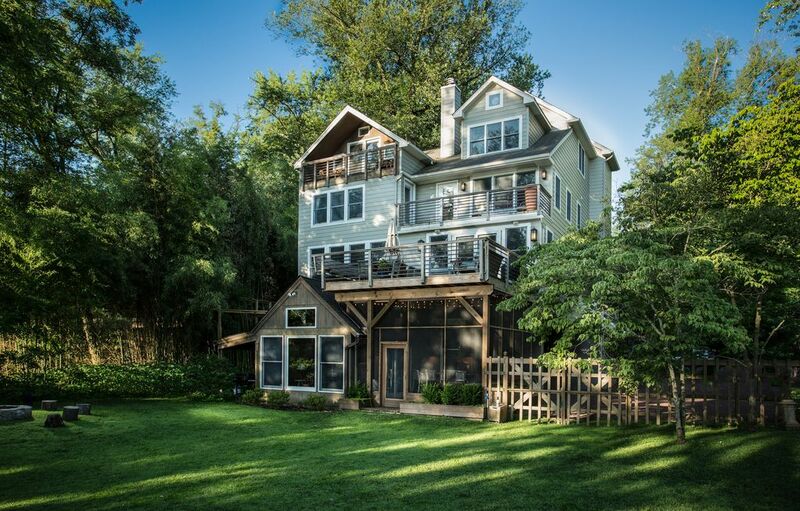 The house is located right on the Delaware river, providing the perfect opportunity for swimming, canoeing, kayaking and fishing. Close to the Delaware Canal tow path for bicycle riding and hiking. About 30 minutes to New Hope, Lambertsville and Doylestown. Families with children will want to visit Sesame Place and the Crayola Factory. Rates: Summer rates for 2017 will be increasing, but if you book now you may have the 2016 rates!